Detroit’s Greektown charts a new path in the face of rising competition. For years, Greektown was the star of dining and entertainment in downtown Detroit. Yet over the last two decades, the central business district has added considerable competition for leisure dollars, including restored theaters, restaurants, stores, casinos, and two sports stadiums, with a third one on the way. Don’t look for a rush of Greek businesses to replace what today is an eclectic mix of stores and restaurants along Monroe, offering everything from deep-dish pizza to barbecued ribs to gourmet burgers. Rather, the entertainment district is taking a page from such metropolises as Miami and Denver, and adding energy, charm, and aesthetics. “We’ve been looking at U.S. cities, but also those in Europe, to bring more character to Monroe Street,” says Tasso Teftsis, a partner in several businesses in Greektown, including Red Smoke, Astoria Bakery, and Krema, with his brother, Michael Teftsis, and sister-in-law, Rosalva Teftsis. The impetus for the changes comes from the recently formed Greektown Preservation Society, a nonprofit planning and operational agency made up of 40 surrounding businesses. It follows the Greektown Merchant’s Association, which was founded in the early 1900s. 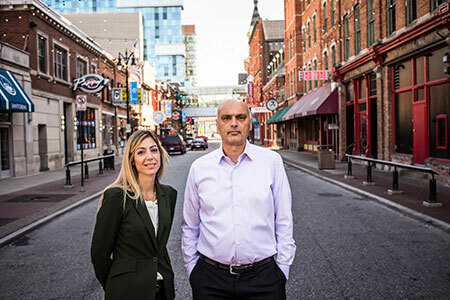 “The Greektown Preservation Society gives us more flexibility in terms of the common improvements and programming we’ve been adding in recent months to set ourselves apart from the rest of downtown,” says Papas, whose family also owns the Pegasus Taverna. Among the initiatives slated to roll out in 2015 are decorative, nonworking parking meters created by local artists (people will be encouraged to drop money in the meters and the funds will be donated to homeless shelters), along with the addition of a historical marker, added greenery, more holiday decorations, and increased marketing programs like the recently launched Greektown Harvest Festival.